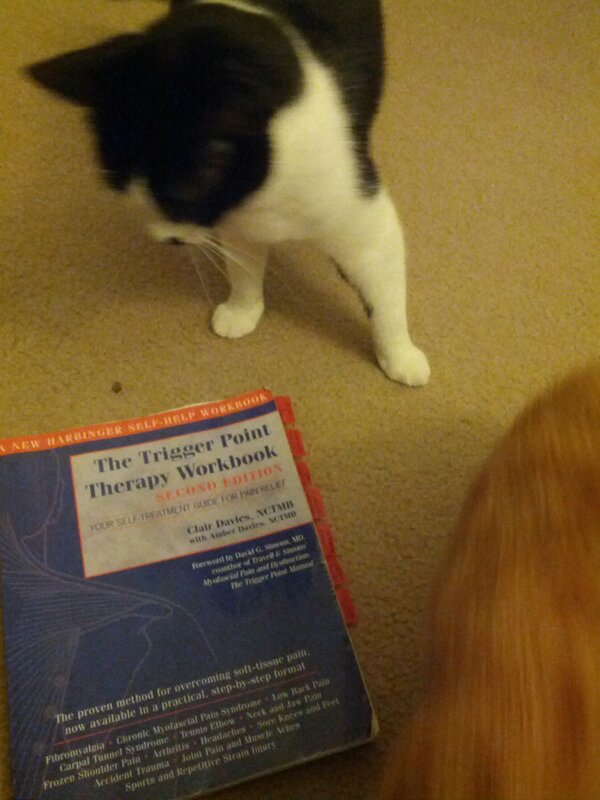 So Teebs (the black and white cat) reminded me of my promise to tell you about one of my favorite massage books: The Trigger Point Therapy Workbook, by Clair Davies. The subtitle is “Your self-treatment guide for pain relief,” and that is the truth. Basically, it breaks down the big red Travell trigger point manuals for the layperson, and gives symptoms, causes, and treatment for almost every trigger point of the body. I mentioned the Theracane yesterday, and that is one of the primary treatment tools. The book features many clear pictures of where to place the Theracane, the lacrosse ball, or the supported thumbs–whatever tool is best–for the most immediate relief. Really, I can’t recommend this book enough. I refer to it several times a week for use with clients, and on myself at home. As you can see in the picture, I’ve added my own tabs for easy reference. As a massage therapist, I definitely suggest getting frequent massage, but in between, this book and some self-massage tools can often help life feel more bearable! This entry was posted in Massage, Self Care and tagged books, massage, NaBloPoMo, pain relief, theracane, Trigger Point Therapy on November 19, 2013 by derryberrymassage.